I borrowed the name from Terry Pratchett's Discworld novels, it refers to the eighth colour of the rainbow, a pigment of your imagination; the Colour of Magic. It suits this magical material I developed a few years ago. It uses powdered minerals including gold silver and copper and pigments applied behind glass and heated. It has a shimmering irridescence opulent and intriguing. I make it in any colour to order to match clients' requirements. 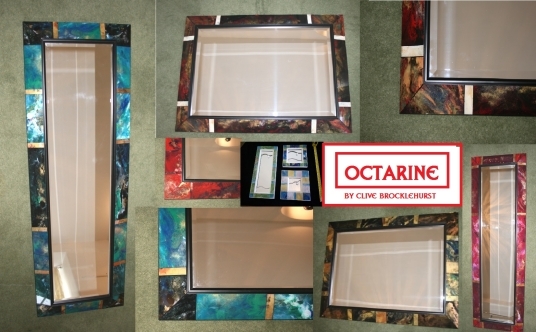 I use it to cover frames for mirrors and keepsake boxes but am always looking for new uses.